This Just In: Crocodile Sausages – Norway’s New Favorite Meal? Home › Culinary Surprises › This Just In: Crocodile Sausages – Norway’s New Favorite Meal? During 2013, you can actually buy sausages made ​​from crocodile, ostrich, wild boar and bison in Norway’s largest convenience store Narvesen. Norway’s largest convenience store Narvesen focuses on exotic sausages. Håvard Mathisen tastes their new bison sausage outside the Oslo Central Station. – This is the type of sausages even gourmets love, says CMO in Narvesen Stian Breivik. Annually, Norwegians consume about 43.000 tons sausages, meaning 115 sausages per Norwegian. Out of these, Narvesen sells 6.5 million sausages every year. Until now, the selection has consisted of two types: Grill and Wiener sausages. – Norwegians are very traditional. 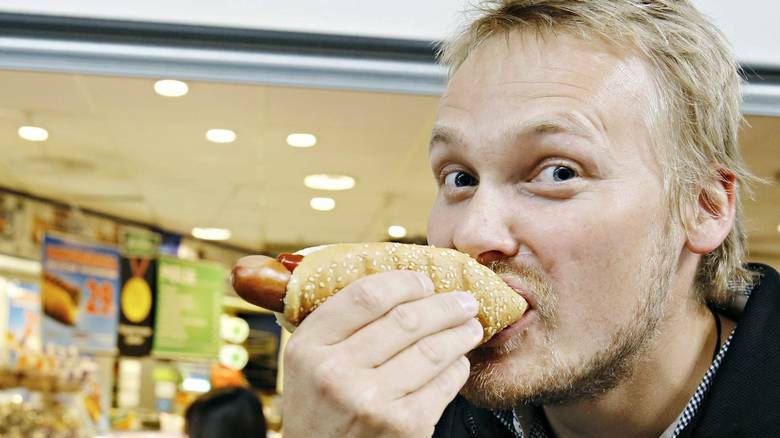 The Wiener sausage has been a bestseller for years, says Breivik. The new sausages made from crocodile, ostrich, wild boar and bison is thus the new gastronomical innovation for getting more customers. Narvesen has strong believes in their new products, but take into account that the Norwegian market is not quite ready for crocodile sausages. Therefore, they will only be sold in selected Narvesen stores in the largest cities – and in a limited quantity. – We have selected types of meat that are not common in Norway. I hope customers dare to try out the sausages, says Asbjørn Koller, CMO in Leiv Vidar (sausage factory). Senior Research Scientist Annechen Bahr Bugge at the National Institute for Consumer Research (SIFO) has researched the Norwegian’s fast food habits. Although the fast food industry has renewed in recent years, she still believes that there is an untapped potential. – A lot of fast food offered is neither corresponding with the national guidelines for nutrition nor consumer preferences, she says. The senior research scientist does not necessarily believe that crocodile sausages are too special and original for the average Norwegian man or woman. – A few years ago, sushi and seaweed was unknown among most Norwegians. Many Norwegians eat food while on the go and many are tired of the basic products. If Norwegians will continue to eat sausages, the producers should make them with higher meat content or with exotic ingredients. That will generate new consumer groups, Bugge continues. Håvard Mathisen was one of the lucky customers who got to try sausages made ​​from bison meat. – It was actually very good! I was pleasantly surprised, he concludes. The bison sausages are now available in Narvesen, while those who want to taste the crocodile version have to wait until September/October.